[W]ith fiscal policy exhausted, the burden must fall on monetary policy. Here we have barely begun to use our atomic arsenal even at zero rates. As Milton Friedman taught us – though nobody in Frankfurt — it is a fallacy to think that low rates are loose. Zero can be extremely tight. That may be the case now with US Treasury yields signalling deflation and M2 velocity collapsing as it did pre-Lehman. To those who argue that the Fed is pushing on the proverbial string, David Beckworth from the University of Texas replies that the Fed showed between 1933 and 1936 that it could deliver blistering growth of 8pc a year despite debt deleveraging in the rest of the economy. [H]ouseholds were also significantly deleveraging during the Great Depression. This experience would fit the standard definition of a balance sheet recession. 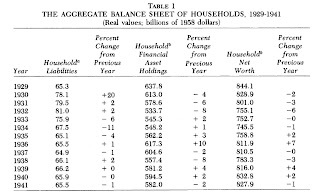 Below is a table from his paper that shows household balance sheets in real terms. Note that between the 1933 and 1936 U.S. household underwent a cumulative deleveraging in real terms of 20%. This is far more in percentage terms that has happened over the past few years. And yet between 1933 and 1936 the U.S. economy had a robust recovery. Real GDP averaged almost 8% growth during these years. The balance sheet recession view cannot easily reconcile the large deleveraging by households and the rapid real economic growth that occurred between 1933 and 1936. What can explain it is a more nuanced view that acknowledges creditors with excess money demand were confronted by FDR’s original quantitative easing program. This QE program was far better than recent ones in that FDR clearly signaled a price level target and backed it up by devaluing the gold content of the dollar and allowing unsterilized gold inflows. In otherwords, FDR signaled that he was going to allow a significant and permanent increase in the monetary base and followed through on it. This change nominal expectations and caused creditors to start spending their money balances. Unfortunately, the 1933-1936 recovery was cut short by a tightening of monetary and fiscal policy. Consequently, many observers overlook this great natural experiment of monetary policy that shows monetary policy does not push on a string when there is significant deleveraging. Another natural experiment is present-day Sweden. Its housing sector also acquired much debt and its economy was also hit hard by the economic crisis. However, it has had a robust recovery and the reason appears to be a much more aggressive monetary policy. All of this shows that monetary policy still can pack a punch. The question, then, is whether the Fed has the desire and political capital to do so. Update: The Mishkin table above is in real terms. To see what was happening to nominal household debt, I constructed the two tables below. The first one converts the Mishkin table into nominal growth rate terms using the CPI. 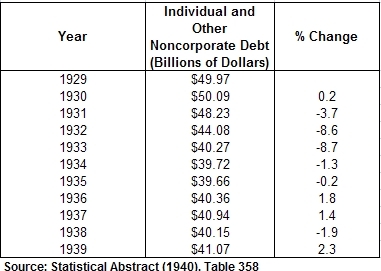 The second one uses current dollar data from the 1940 statistical abstract on “individual and other noncorporate” debt. 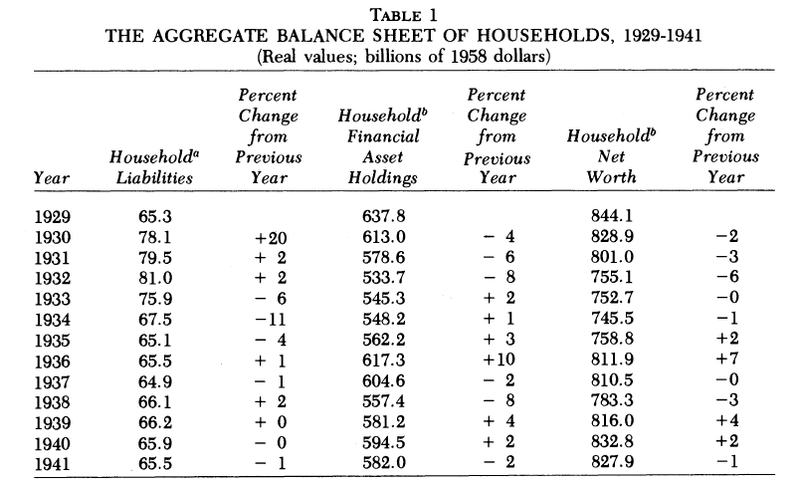 Both tables indicate nominal household debt was falling through 1935. So the recovery of 1933-1936 largely coincided with a reduction in household nominal debt too.